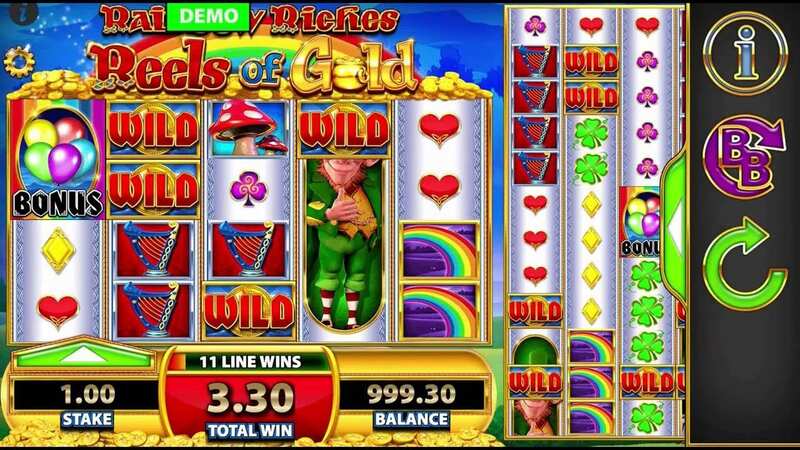 In Rainbow Riches: Reels of Gold, SG Interactive and Barcrest continue their hugely popular online slots series. Greeted at the loading screen by a friendly leprechaun and his magical fairy friend, the pair welcome you into an enchanting world of bright green grass and clear blue skies, where the paths are paved with gold and jackpots lie at the end of every rainbow in online slots uk! As you spin the reels of this online slot, you’ll be soothed with a gentle harp harmony. Click the Big Bet button to hear a predictably jaunty Irish jig, full of fiddle and harp. Cheery flutes kick in when you select your Big Bet Game; suitably for this high stake bonus game, the music is at its liveliest. It's why this is considered to be one of the best new video slots in terms of bonus features. The visuals in the Rainbow Riches series has never been a major selling point. It’s pretty, no doubt, but never showy, offering clear and simple symbols. Its presentation is inevitably a little muddled Reels of Gold if only because there is so much to cram into the bustling screen, certain options have to be periodically hidden and revealed by the use of tabs. This busy casino game is packed to the rafters, taking place across 2 Gameboards! The main board has 4 rows and 5 reels but hitting spin will simultaneously rotate the colossal board, 5 reels that each stand a whopping 12 icons high! With 80 icons landing on every spin, there is plenty of opportunities to hit a match, particularly with 100 paylines in play. Stakes are modifiable however, allowing the opportunity to bet low with less paylines in blocks of 20. The full stake options range from 0.10 to 500, so this is one online slot with a price to suit every player. Low value icons: There are 4 low value symbols, each gilded with gold: a heart, spade, diamond and club. 3 of a kind win 10 while 5 awards 100. Mid level icons: 4 mid level symbols are represented by magic toadstools, a blue harp, a 4 leaf clover and a shiny silver lucky horseshoe. High value icons: There are only 2 high value symbols, although the leprechaun symbol is stacked, as well as offering the highest reward: 500 for 5 of a kind. The remaining icon is a rainbow, offering between 40 and 400 for 3 to 5 matches. WILDS and SCATTERS: There are 4 WILD symbols, 3 with ‘WILD’ emblazoned across them and varying backgrounds to distinguish them. The fourth WILD bears the title ‘Rainbow Riches’ and can appear stacked on the main Gameboard. If they appear stacked, the stack will transfer from the main reel to the corresponding colossal reel for extra opportunities. The SCATTER is a Balloon Bonus symbol. * Magic Wilds - Blocks of WILDS appear on some reels, moving up and down until reaching a stop and accumulating any matches. * Wild Burst - Butterflies burst forth from the fairy’s magic wand, floating over random icons and turning them WILD. * Magic Symbols - Any of the 4 low-value card symbols turn into wishing wells which in turn change to reveal a single symbol. * Reel Win Multipliers - A x2, x3 or x5 multiplier will be awarded and any wins from that spin multiplied by the given amount. * Super Wild Stacks - Blocks of WILDS expand vertically to fill a reel on the main board then transfer to the corresponding colossal reel. * Balloon Bonus - If 2 balloon symbols appear, the fairy may add more to kickstart the Free Spins Pick Me bonus round. * Reel Win Shuffle - The fairy may shuffle the reels only to stop them to complete a winning line. Free Spins: 3 or more SCATTERS across both sets of reels will trigger the Free Spins Pick Me bonus. Note that SCATTERS only appear on reel 1, 3 and 5 of both the main reels and colossal reels. In Free Spins Pick Me, the player is awarded a win and offered a number of picks dependent on the number of SCATTERS. Each pick reveals a number of free spins and, generously, extra spins can be awarded within the bonus game. * Gamble option – When playing with a stake of 0.50 and above, a gamble option is offered. Several wheels appear onscreen with a different number above each. The wheels have a green section, representing a win, and a red section, representing a fail. Spin a wheel and if you land in the green, you are awarded extra spins to the tune of the number above your chosen wheel. Big Bet Games: Hit the BB button on the right of the screen to choose a Big Bet game. These consist of 5 linked spins of the reels; wins are accumulated. 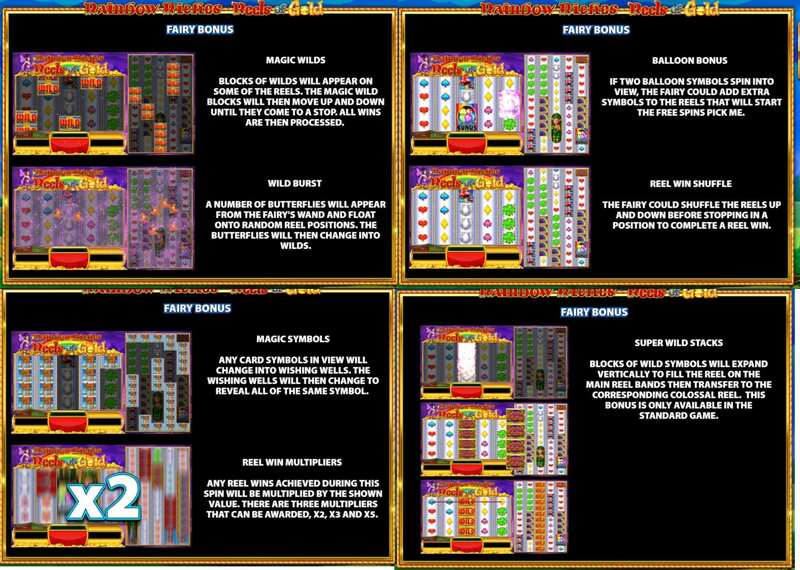 In Big Bet Games, one or more WILDS will expand to fill the main reel then transfer to the corresponding colossal reel. * Big Bet Free Spins Trail – Big Bet Games also feature a meter that records the number of SCATTERS that appear during the spins. Fill the meter to win free spins!